First published in 1854, Henry David Thoreau’s groundbreaking book has influenced generations of readers and continues to inspire and inform anyone with an open mind, a love of nature, and a longing for simplicity and contemplation. Bill McKibben provides a newly revised introduction and helpful annotations that place Thoreau firmly in his role as cultural and spiritual seer. 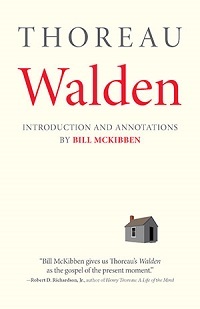 This beautiful edition of Walden, published in honor of the bicentennial of Thoreau’s birth, is more accessible and relevant than ever in an age of technological change and ecological crisis.